Stamp several Leaves on cork with Autumn Kaleidacolor ink. Add several confetti leaves to cork with glue. Stamp leaves on tags using the same fall colored dye inks. Add fibers to tags and layer to card with foam tape. 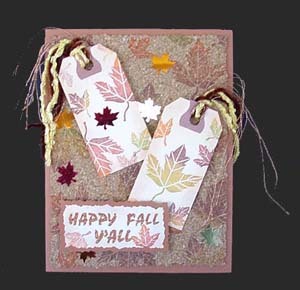 On cream card, stamp Happy Fall Y’all with pigment ink and emboss with Terra Cotta powder. Cut edges with deckle scissors and attach with double stick tape or glue to a slightly larger Terra Cotta piece. Stick onto cork with foam tape. Layer all to Terra Cotta card.